Cold Air: November 2014 Sets another record—wind blows harder than ever! November 2014 Sets another record—wind blows harder than ever! Wind made up 6.6% of total supply and represented 10.7% of what the market valued all generation at, but it also drives down the market rates which transfers costs to the smaller Ontario ratepayer. No small wonder why our electricity rates are continuing their relentless march upwards! The Global Adjustment didn't set a new record as it did in October, but at $870.2 million it is the second highest on record, as is the $82.32/MWh class B rate. Coupled with the $16.49 HOEP (Hourly Ontario Energy Price), the “bare bones” price for the commodity will be 9.9 cents/kWh for most Ontario ratepayers. That price is before inclusion of all other nickel-and-dime charges such as regulatory, debt retirement, delivery, HST, etc. The low HOEP in November continues a trend that has seen 3 of the 5 lowest weighted monthly average rates occur in the past three months. As we demonstrated in reporting on October’s record pricing, the low HOEP rates result in a large shift in supply costs away from export markets and Ontario’s largest consumers to the rest of us. During November Ontario had the highest average hourly Ontario demand it had experienced since March, so low demand was not the driver of low market pricing. That high supply was significantly attributable to record generation3 from Ontario’s rapidly increasing number of industrial wind turbines. 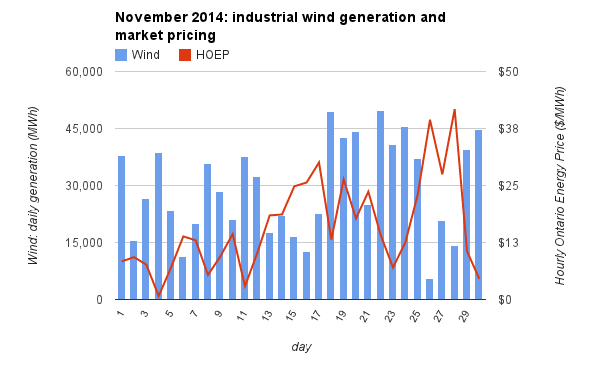 The trend of high winds accompanying low pricing was particularly evident during November. Another trend was apparent during wind’s record production month—the IESO’s market experienced the highest average hourly net export of electricity. 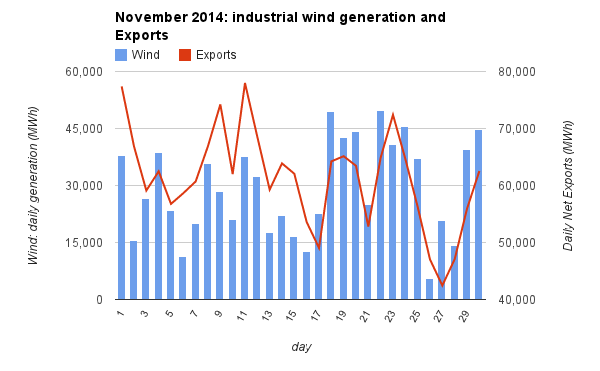 Exports, like pricing, were related to wind generation; high wind days were high export days, particularly in the latter part of November. Also during November, the Ontario Energy Board (OEB) was preparing for a Natural Gas Market Review and invited various participants to become involved. One of the participants was the OPA or Ontario Power Authority (due to merge shortly with the Independent Electricity System Operator/IESO) and they prepared a Power Point Presentation with interesting commentary. Here are three that caught our attention. That ability of coal generation to compensate for the wind's variability disappeared earlier this year after Premier Wynne and the Energy Minister shut them down and was praised by Al Gore for doing so. Here is one of the charts (one month of wind output) from the OPA presentation reflecting the volatility of wind generation. Delving further into wind's volatility, one need only look at IESO who have responsibility for managing the electricity grid, forecasting our power needs, and ensuring that generators are ready for any spikes or drops in power demand to prevent blackouts or brownouts. The volatility caused by wind generation has become an issue that they must now deal with and it appears to be causing them problems. This is somewhat evident if one simply looks at the daily demand at hour 17 on December 2, 2014, as wind dropped relatively quickly as demand was rising. The result was the HOEP went from $30.23 per/MWh to $643.00 per MWh from one hour to the next. The question raised by this occurrence is: was this bad planning, or volatility caused by the sun sinking (no solar output) and the wind dying down coupled with ratepayers turning on their lights? It seems as though IESO misses their forecasts with greater frequency as more and more renewables (both visible and embedded) are added to the grid. This would seem to imply that when the wind dies down or picks up, or when clouds pass overhead or when the sun actually shines on solar panels, they scramble to balance supply with demand. That begs these questions: has IESO the ability to manage the volatility of renewable energy? And, Why should they continue to fumble with adding unreliable sources as Ontario is already oversupplied with very low emission electricity? Based on recent evidence of record-breaking price increases for Ontario's ratepayers, and the apparent difficulties of managing Ontario's electricity grid, perhaps it is time to stop adding intermittent and unreliable renewable energy to the grid. The Ontario Energy Board’s Regulated Price Plan Price Report for November 1, 2014 to October 31, 2015 shows wind at 12.3 cents/kWh, which is $123/MWh. The total includes spending on non-generation items, including conservation and imports. 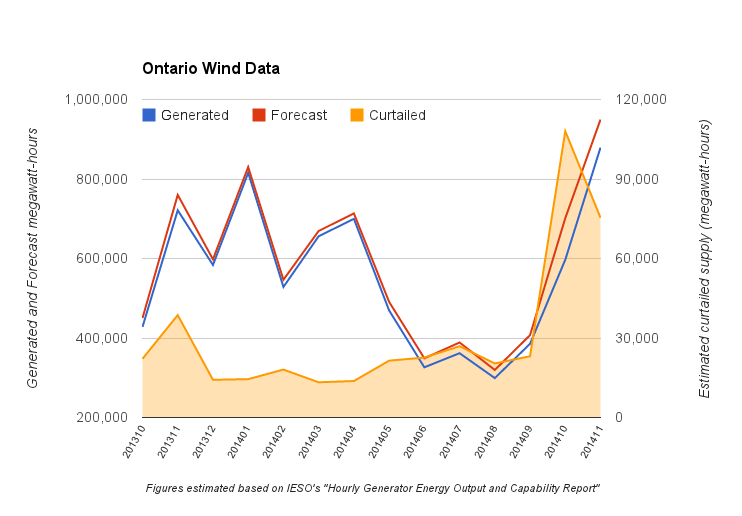 The IESO data clearly shows record month wind generation - but the IESO has so far failed to report on the rapidly growing curtailment of wind generators.